Bulgur, a precooked, dried grain product, is made from cracked wheat. It is a staple in Middle Eastern cooking, and is traditionally used as a base for tabbouleh salad. 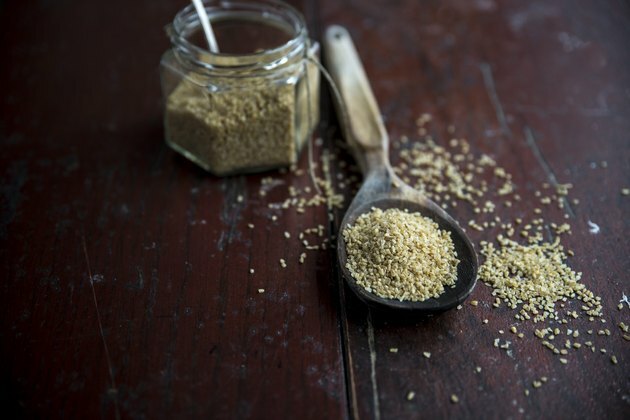 Because it is already cooked and dried, bulgur can be prepared quickly and easily, especially if you use a finer grind that absorbs water more quickly than the coarser versions. Its flavor is complex and nutty, and it has respectable amounts of protein and fiber, with 6 grams of protein and 8 grams of fiber in a 1 cup serving of the cooked grain. 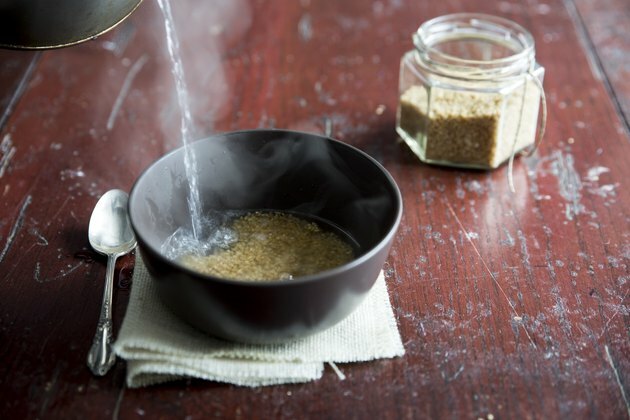 Pour boiling water over the dry grain in a bowl or small saucepan, using 2 parts water for each 1 part of grain. For example, if you're using 1 cup uncooked bulgur, use 2 cups of boiling water. A fine-ground bulgur will soften in about seven minutes, while a medium grind bulgur will be ready to eat in around 15 minutes. Once the bulgur is soft, drain excess liquid. Do not use the soaking method for coarse or extra coarse bulgur. Bring water to a boil in a saucepan, add the bulgur, and cook it uncovered until the grain is soft, stirring occasionally. For medium and finely ground bulgur, use 3 parts water for each 1 part bulgur. For coarsely ground bulgur, use 2 1/4 parts water for each 1 part bulgur. Cook fine bulgur for two minutes, medium bulgur for eight minutes, and coarse bulgur for 20 minutes. 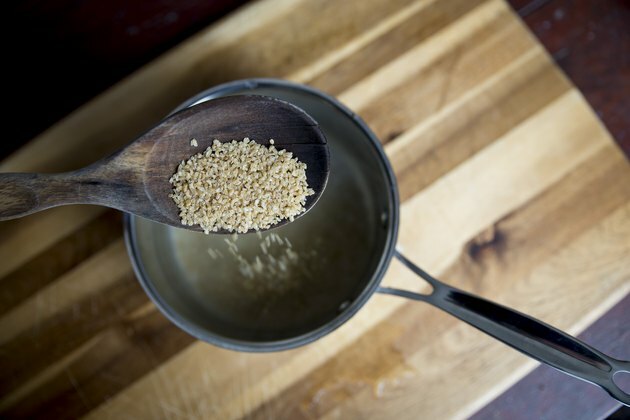 After turning off the heat, cover the pan and let fine or medium grind bulgur stand for four or five minutes before draining off the excess water. Coarse bulgur does not need to stand extra time before serving. 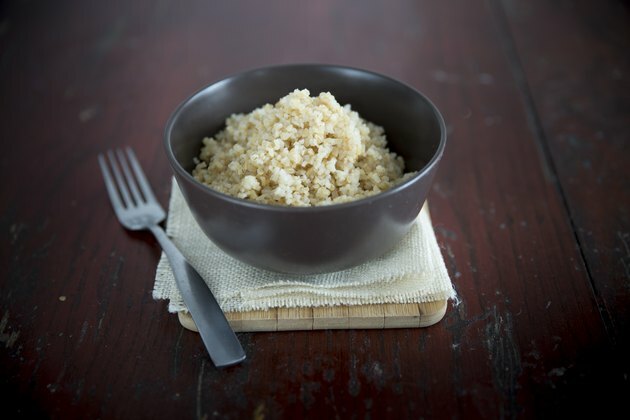 Cover the grain with water in a microwave-safe bowl, using 1 3/4 parts warm water for each 1 part fine- or medium-grind bulgur, or 3 parts warm water for each 1 part coarsely ground bulgur. Microwave fine-grind bulgur on high power for 2:15 minutes, microwave medium bulgur for 4:00 minutes, and microwave coarse bulgur for 7:00 minutes. After microwaving, stir, then let the bulgur stand for about seven minutes.